Editorials from Theslowlane: Does vacation have to prove or accomplish something? Does vacation have to prove or accomplish something? And it's tempting to thumb my nose at news headlines saying Americans are taking shorter trips due to gas prices. Since I bicycle, my trip could be as long as ever. Still, I'm thinking of staying closer to home also. There is so much in this area, with-in maybe a 300 mile radius, that I normally don't have time to see. 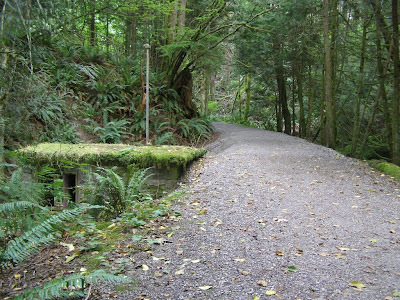 Photo shows cool bike trail along Padden Creek in Bellingham. Old sandstone remnants of water system. Many don't discover these gems when they just fly over things or stick to the freeway. For longer trips, I usually take the train back home from anyway. Amtrak prices have probably gone up, but not too bad. Main problem, I've run out of places that interest me with easy train connections back home. How many times should I go down California Coast? So far, this lifetime, 5 times. Biking east across USA takes at least 2 months. I usually only get around 5 weeks. Maybe some year, I'll add more leave of absence to vacation. 5 weeks might get me just past North Dakota and I'd have to take the train back just before the interesting part of the eastern states. How many times should I visit Eastern Washington? Some people suggest Colorado, but taking the train there means going to California first. Train doesn't do the diagonal. Maybe the Amtrak ThruWay bus does. There's always flying. People say it's an ordeal. My last flight was early 1980s, well before 911. Such a small plane that every seat was a window seat. It was fun. The view, fantastic, but short lived. Maybe flying is still OK. Shipping my bike and all of that. Takes some logistics. I'm supposed to be on vacation. There's a lot of smaller trips around here to interesting cities, hot tubs, bike trails around places like Vancouver, BC, Seattle, Portland, Oregon, San Juan Islands, Olympic Peninsula. May even take train as far as Eugene. Also I plan to pass through Bellingham a few times and then head out again. Sleep in my own bed, rather than being away for several weeks solid. Yesterday, I watched them tear down an old building to make way for mixed income housing. The old Walton Beverage Warehouse. Some people are sad to see it go. Relic of an era when buildings weren't trying to be pretty. I stopped and watched for quite a while. Also ate some blackberries that were growing through the fence. Glad I wasn't too busy. An interesting "happening" to stumble upon.